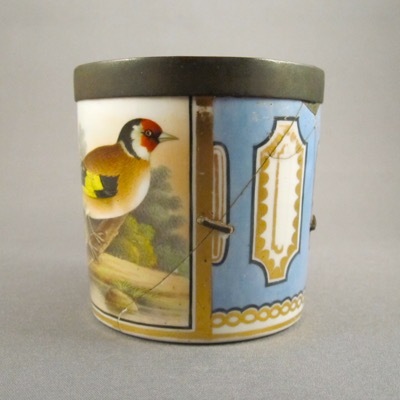 This gorgeous porcelain drum form inkwell with conical reservoir and 3 quill holes is hand painted in polychrome enamels with gilt highlights. 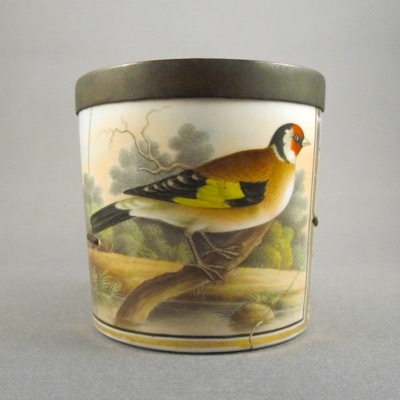 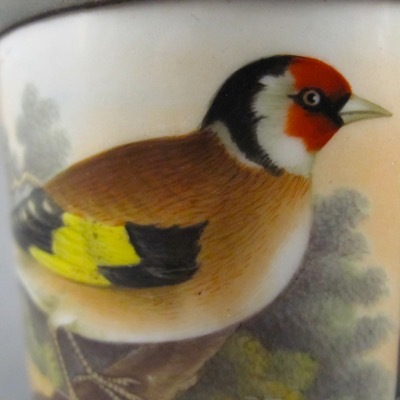 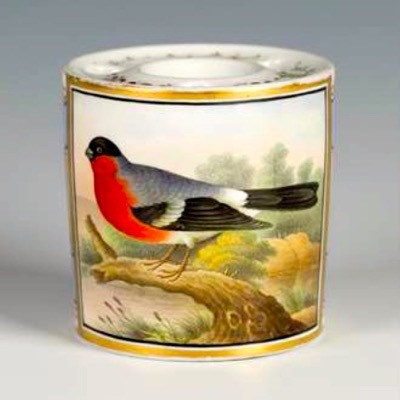 Made by Worcester around 1810, it is marked on the underside in red script “Goldfinch / Chamberlain’s Worcester.” It measures nearly 2.75 inches high with a diameter of just over 2.5 inches. 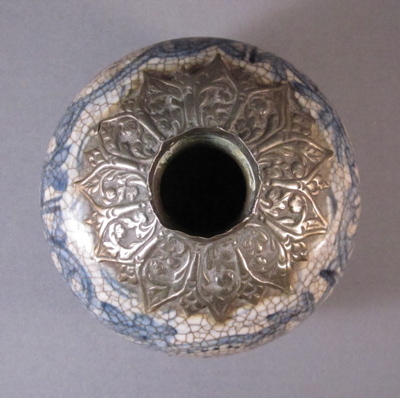 I can just imagine the dreaded day, well over 150 years ago, when this expensive inkwell dropped to the hard floor, breaking into 4 pieces. 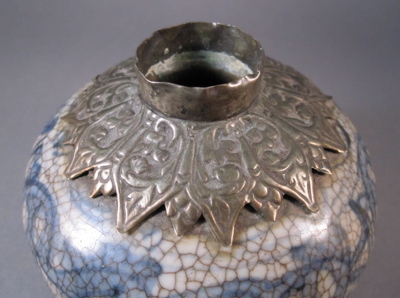 A skilled tinker or itinerant “china mender” came to the rescue by adding 7 iron staples and a copper band around the top, enabling the inkwell to function again. 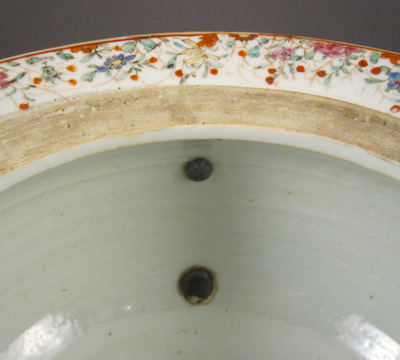 Putty was added to help seal gaps left along the rim and for added assurance that ink would not seep through the bonded cracks. 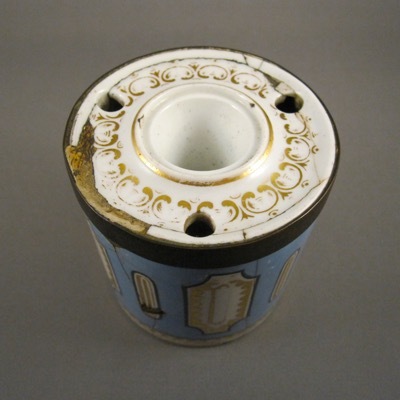 This is another rare example of a Chamberlains Worcester inkwell, minus the early repairs that mine has. 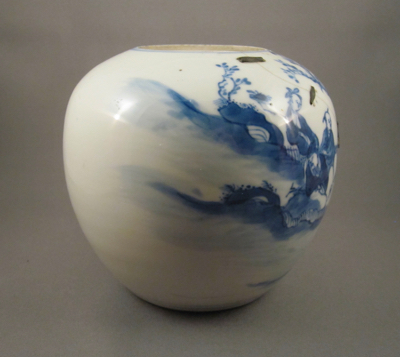 This small Chinese porcelain “Kangxi revival” jar was made during the latter part of the Qing dynasty (1644-1912), Guangxu period (1875-1908). 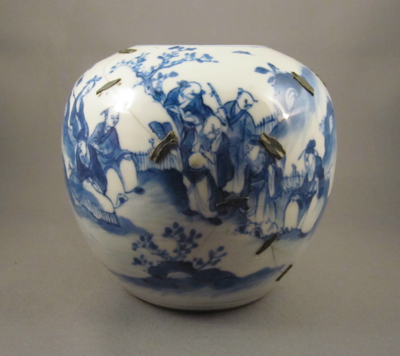 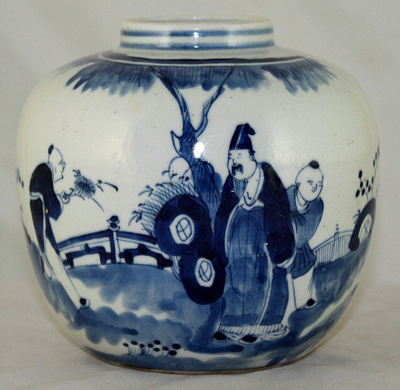 It is decorated in cobalt blue underglaze with eight figures and stands about 5″ high, with a four character mark on the underside. 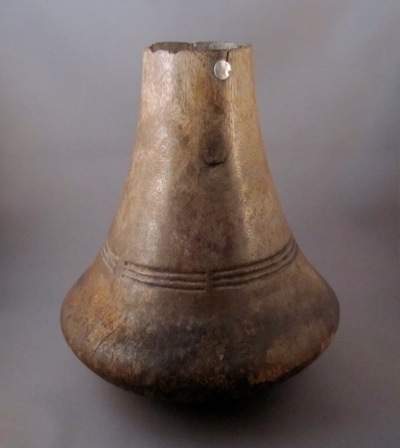 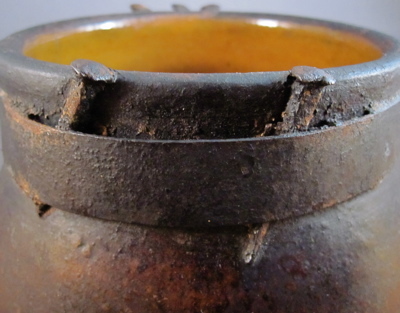 At some point during its early life this jar was dropped, resulting in a complex fracture. 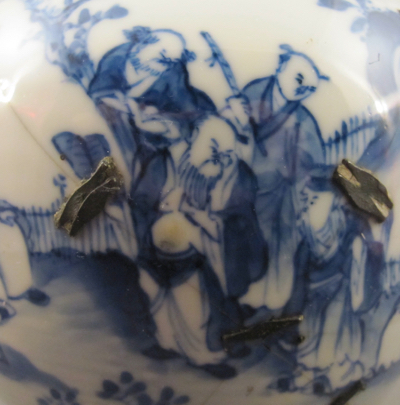 But rather than tossing the broken pieces out on to the curb, they were taken to a china mender who lovingly restored the jar using metal staples, aka rivets. 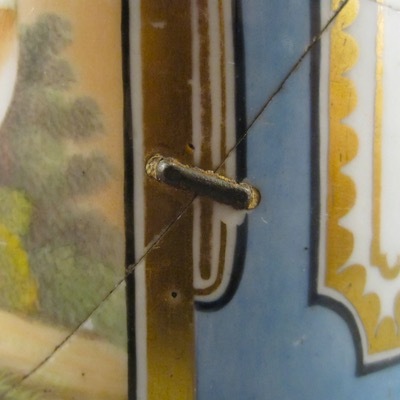 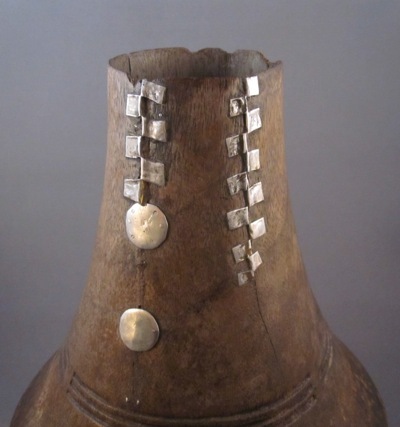 Judging by the form and the use of double rivets, the repair appears to have been done in the Middle East, where recycled wire was used by itinerant street menders to form flattened rivets. 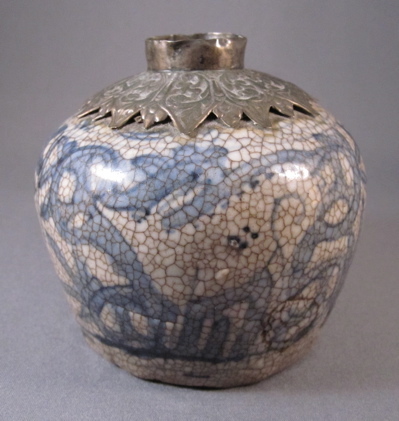 This jar has a similar form and decoration and remains in one piece. 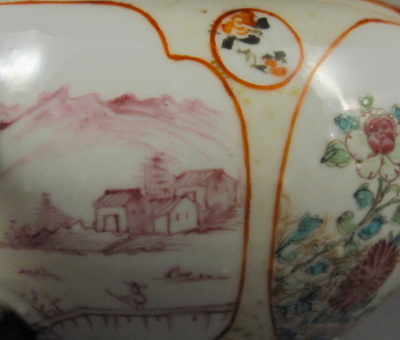 I own a classic book about collecting antique English household pottery, “If these Pots Could Talk” by Ivor Noel Hume. 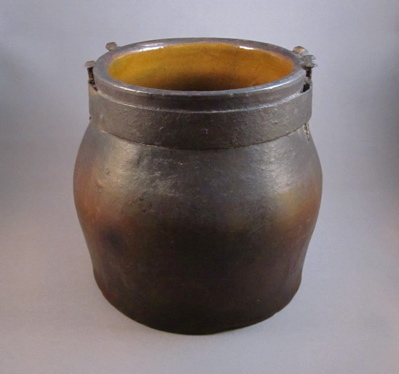 Regarding the early usage of this particular pot, I’d rather not hear what it has to say. 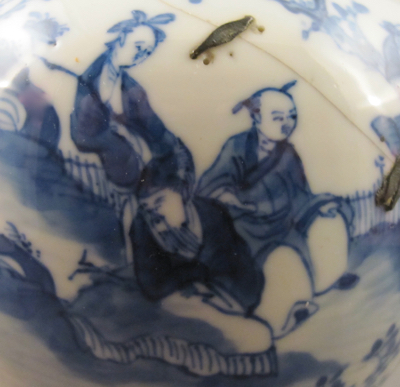 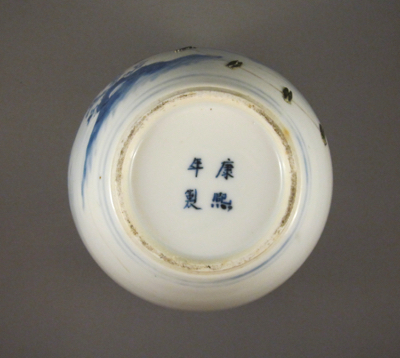 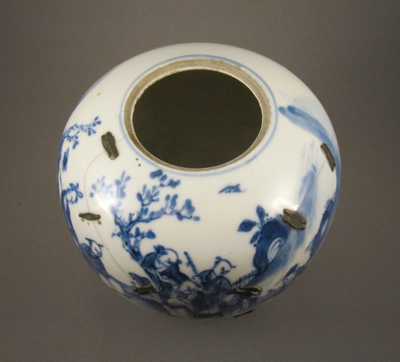 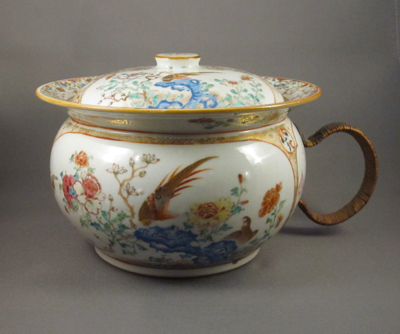 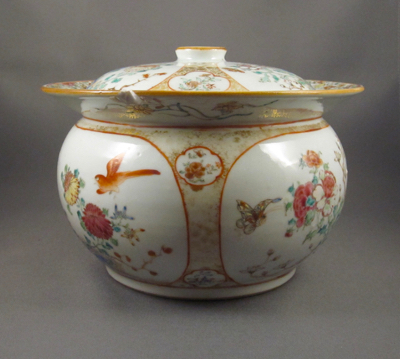 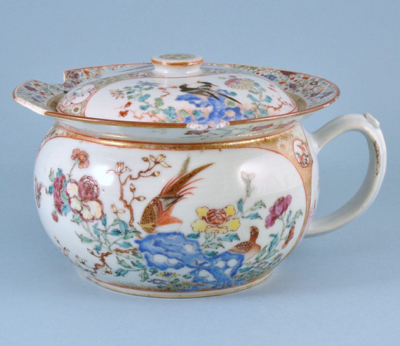 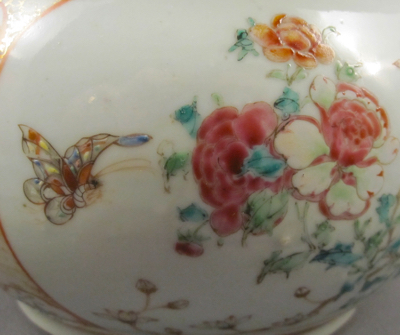 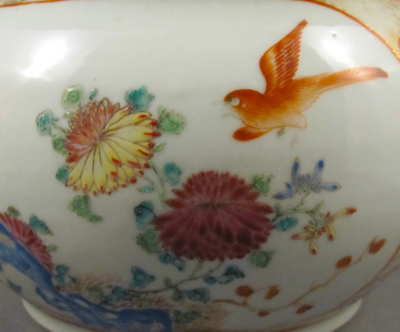 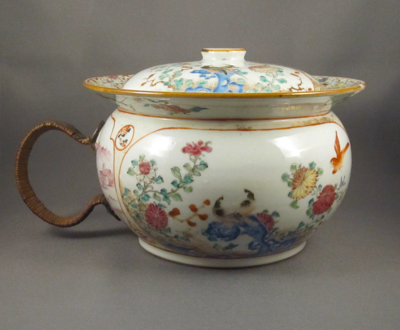 This Chinese export porcelain chamber pot with cover dates from the Qianlong period (1735-1796) and measures 5-1/2″ high to the top of the lid and is 9-1/2″ wide to the end of the handle. 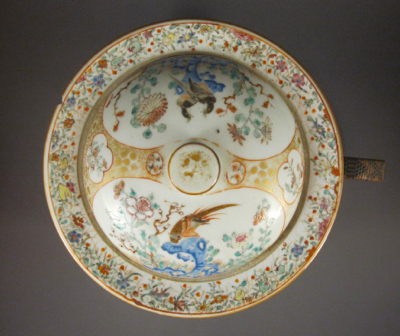 It is hand decorated in the Famille Rose palette with panels of birds and flowers with gilt highlights. 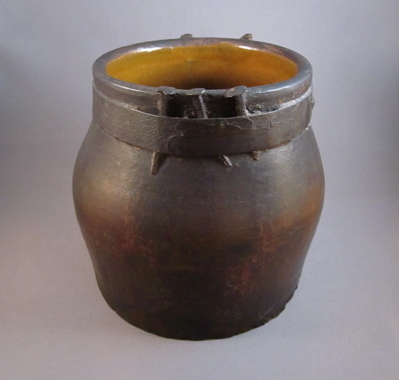 The thought of about how this pot lost its original handle is something I’d rather not dwell on but I just hope it was empty when it broke. 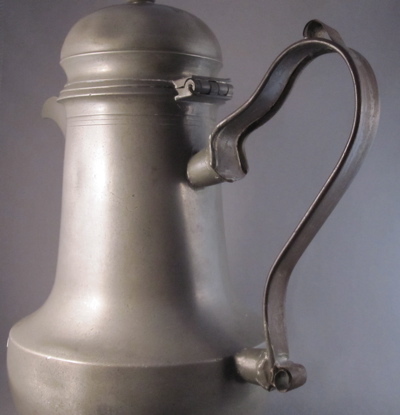 As this was an expensive and necessary asset to the household, it was not thrown out but immediately repaired and put back in to use. 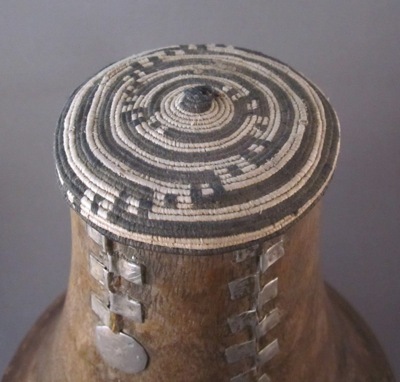 Most likely it was taken to a china mender who made a sturdy metal replacement handle, then covered it in woven wicker to aid against further slippage. 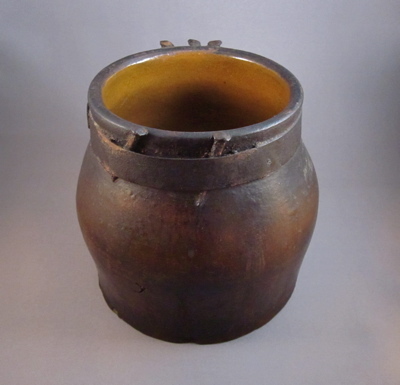 I remember a certain customer in my parents antiques shop years ago who purchased a large Victorian ceramic slop bucket from a bedroom chamber set. 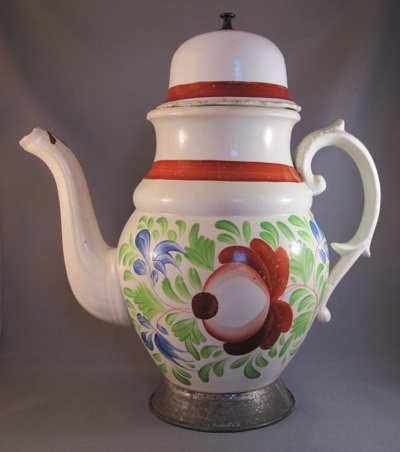 Knowing what it was, she proceeded to boast that she intended to use it as a soup tureen at an upcoming dinner party she was throwing for the kids where she had already talked to the http://www.jumpersjungle.com/santa-fe-springs/, team from kids birthday parties Santa Fe Springs to help her. 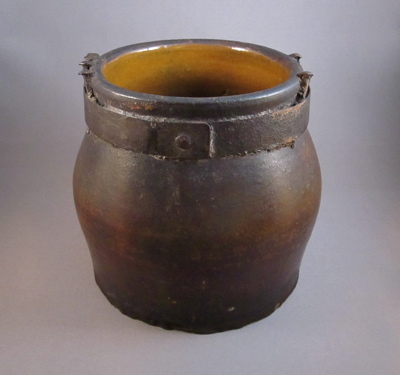 If that pot could talk, I hope it would have warned the dinner guests not to eat the chowder! 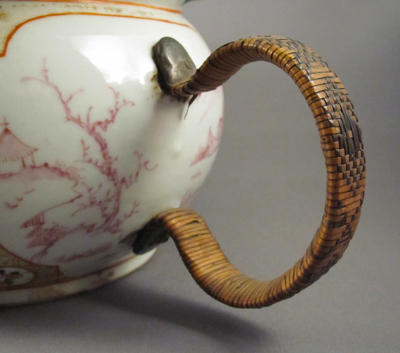 This identical example shows what the original handle on mine looked like before it broke off. 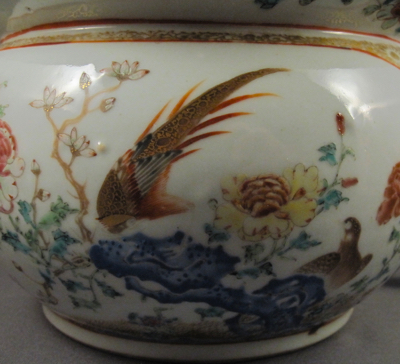 Notice the multiple chips along the rim. 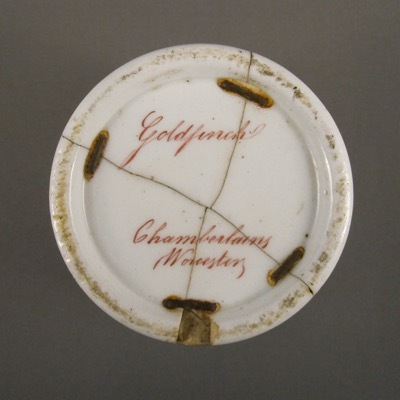 I’m guessing that many chamber pots went bump in the night. 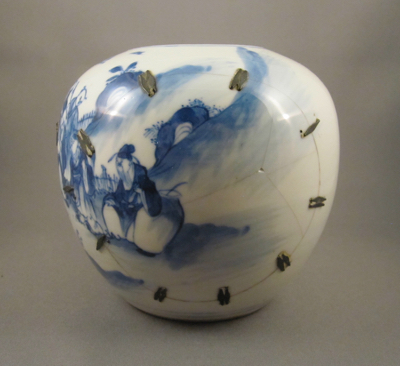 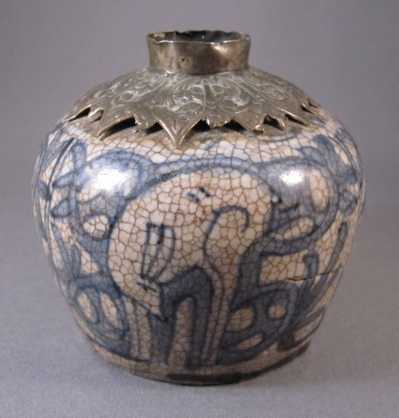 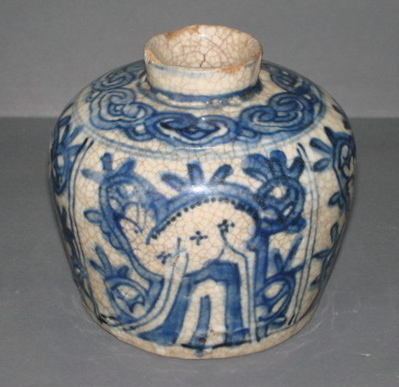 Small Wanli period (1573-1620) Ming pottery jar from Swatow, in Southeast China, with a blue underglaze decoration of deer and stylized plants with crackle glaze. 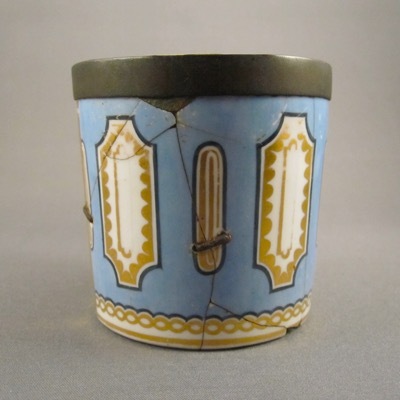 I purchased this great little jar from a ceramics dealer in Amsterdam, where a replacement neck was created over 200 years ago after the original neck broke off. 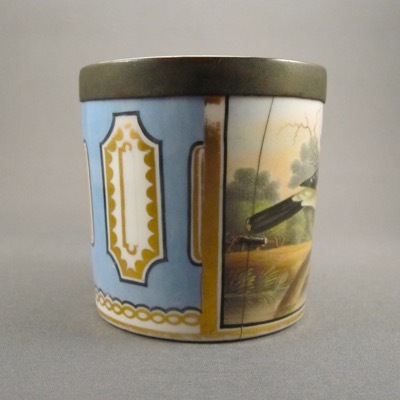 Jar measures 3-1/4″ high, 3-1/4″ wide. 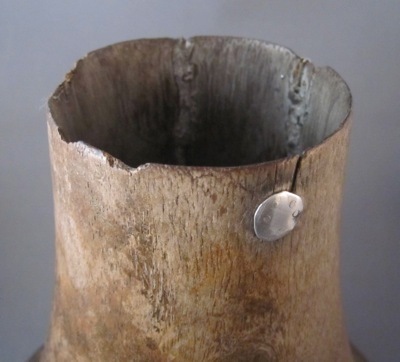 Remains of the original broken neck are mostly obscured by the replacement neck and collar. 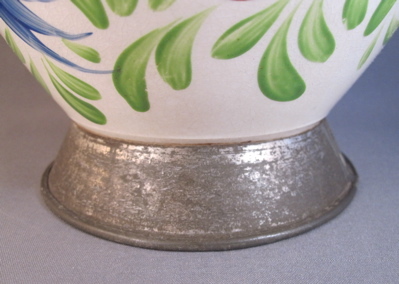 The Dutch replacement copper neck has an elaborately engraved floral design. 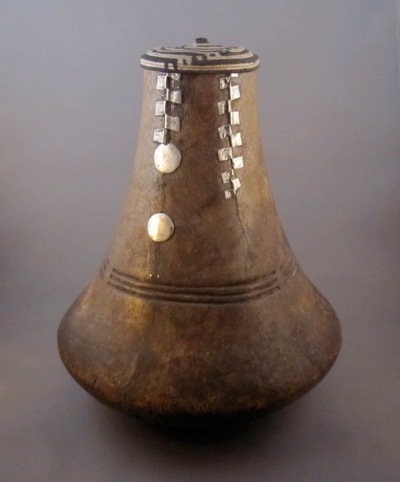 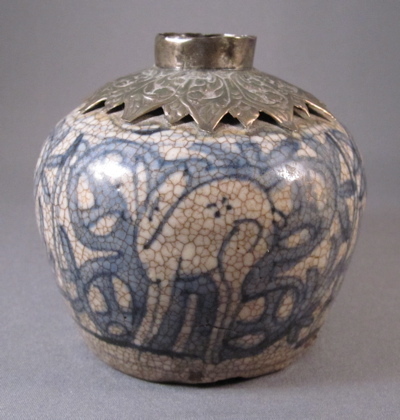 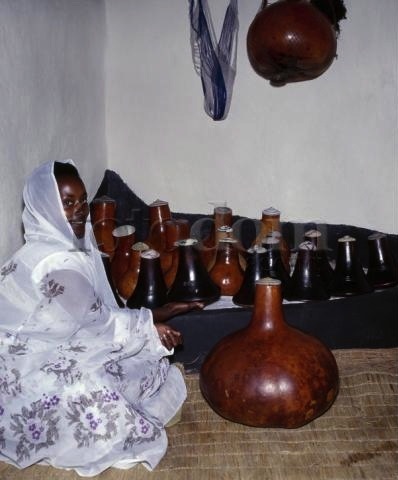 This jar has the same form and decoration as mine but with an intact neck. 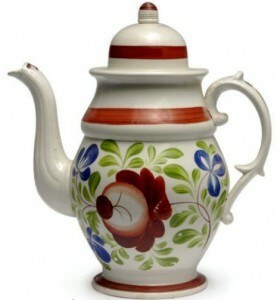 Colorful pearlware baluster shaped coffee pot from England with double repairs and “King’s Rose” pattern decoration. 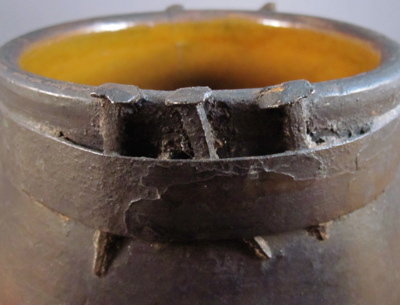 Pot stands 12″ high, and has seen better days. 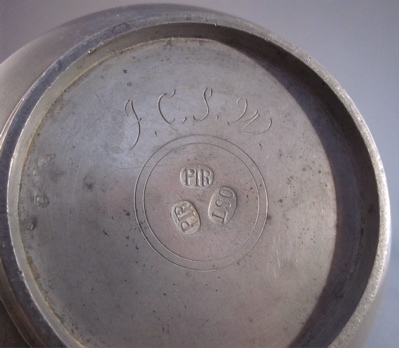 The base, riddled with large chips and no longer able to support the pot, was repaired with tin replacement in the middle to late 1800’s. 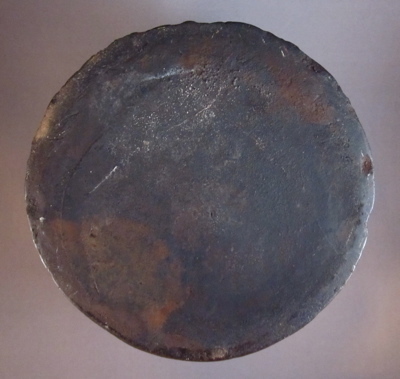 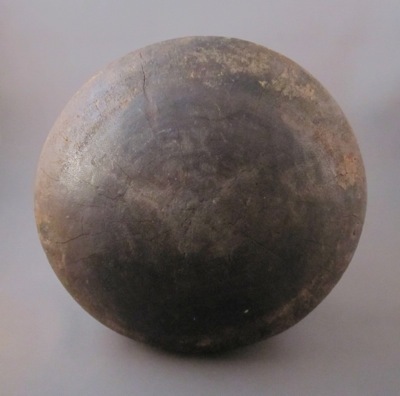 The ill-fitting domed lid, possibly from another piece in the set, originally had a skep shaped knob. 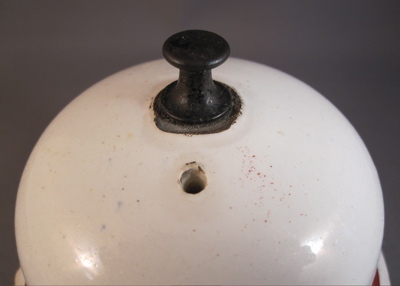 This replaced knob, made of iron and looking like a large push pin, has been bolted through the top of the lid. 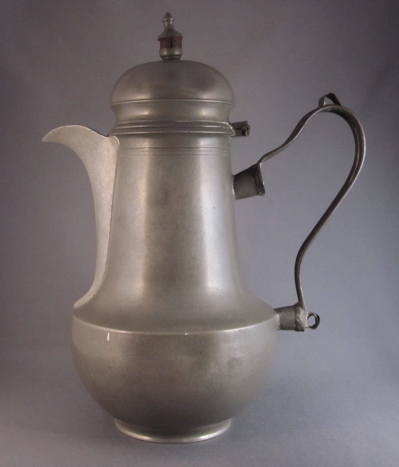 An astonishingly similar coffee pot, in wonderful condition, boasts its original base and finial.